Remember the other day when I mentioned recipes I posted photos of on Facebook before the recipe was ready to be posted? Well here’s another one. I was so charmed by these little cookies that I had to share before I had typed them up. See these might just look like cute little colorful cookies with a non-specific message on them* but they’re a little more. They have a bright citrusy taste and are pretty much the funnest breakfast I’ve ever had. 1. We’re going to be on The Today Show! Next Monday Feb. 4th in the 10 am hour – we’re going to be making three of the recipes from our book that’s coming out next week. Yep – NEXT WEEK! 2. I know a lot of you have been interested in seeing inside Betty Goes Vegan before you commit to letting this book into your home library. Well, more good news! You can now see a sneak preview on Amazon! It’s only some of the recipes and writing but there is a look at the glossary so you can see what recipes made the final cut. Also you can see some of the photos in this video on the blog SimpleDailyRecipes.com! Is that enough to celebrate? Need more? OK – New seasons of Face Off and Being Human just started and we have friends coming to NYC from all over to attend the Betty Goes Vegan launch party at Moo Shoes in SoHo next Tuesday night. If you’re in the neighborhood – please stop by! Things are starting at 7:30 and we’re going to have food from Cinnamon Snail! How about now? Good enough to justify cookies for breakfast? Grab your sprinkles – let’s do this! In a large bowl, blend Powdered Sugar, Margarine, Almond Milk, Lemon Peel, Vanilla and Lemon extracts with an electric hand held mixer until smooth. Then gradually mix in Flour, Cornstarch, Baking Soda and Cream of Tartar and blend until it is a soft dough. It will first become small pebbles but if you continue to blend it will become a dough. Be patient.With a large spoon, mix in the Sprinkles until it is evenly spread though out the dough. Cover the bowl with foil and chill in the fridge for 1 hour. After the dough has chilled, pull it out and using a soup spoon to scoop out your cookies. Use your hands to form them into coins smaller than your palm but smooth and place them on an unlined cookie sheet. Bake the cookies for 5 to 7 minutes or until they are a light golden brown. * We used these message cookie cutters from William-Sonoma to make these little guys. I won’t lie. These aren’t the easiest gadget to use. For some reason the A was pretty much impossible to get in and out of the cutter. Really those As were the most dramatic part of this recipe. 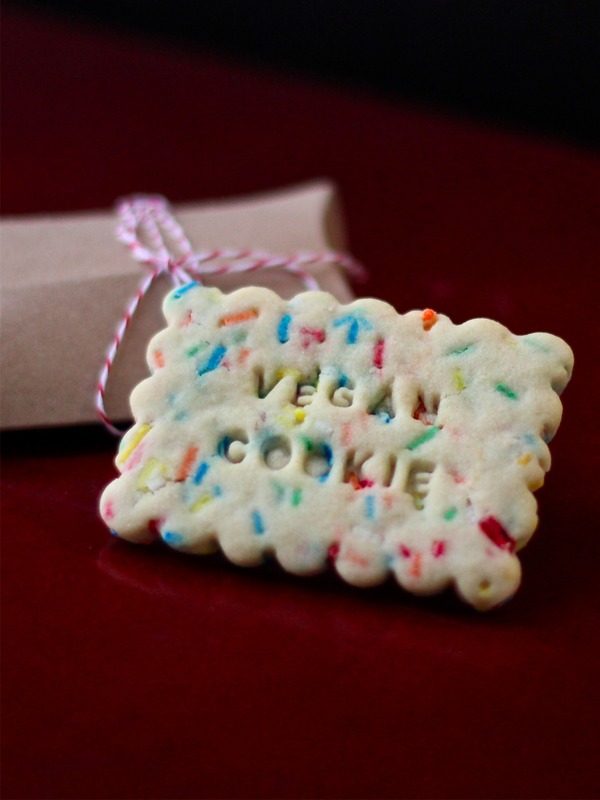 We used the Betty Crocker sprinkles – they’re vegan! Even more reason to love that Betty! So excited for all of your great news! I’ve got my DVR set to record The Today Show and I’ve got my cookbook pre-ordered on Amazon! I just wish I lived a little closer so I could join the festivities in NYC. Congrats! In high school, I brought funfetti cupcakes to celebrate my classmates birthdays (I tended to be in smaller classes — I didn’t make cupcakes for all 400 people in my grade). These look just as delicious and way more adorable! I wish the message cutter was easier to use. I might be willing to put up with it anyway, since the results are so cute. Congrats on all this great news! I’m glad I opened this post when I did because I was just in time to catch the last couple minutes of you on the Today Show. I came in right before the ladies asked Annie why people become vegan. I wish I’d gotten to see more, but I’m sure the power of the internet will provide the whole segment available for viewing later. Sorry I don’t really know the answer to this. We’ve been vegan for 20+ years and haven’t made anything with cow’s milk in basically forever. We do hop eyou ‘ll at least try it with the soy milk… you might not be able tell the difference. Thanks Annie for getting back to me .